Continuing an annual tradition which started in 1807, the Gran Teatro La Fenice presents what might be regarded as the main highlight of the Venetian Carnival - the Grand Cavalchina Ball. Considered to be the most exclusive and spectacular ball in Venice, the Cavalchina attracts people from all over the world, including great artists and aristocracy, who are all eager to attend this famous masked ball. The tradition of the Cavalchina Ball dates back to the beginning of the ottocento (19th century) when there were horse races in the City of Canals, giving this magnificent event its name. Horsemen from all over the world considered winning the race in St Mark’s Square in Venice - transformed into an arena – to be one of the most coveted prizes. 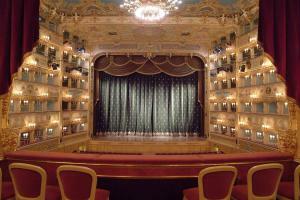 After the race, victors and losers alike would attend the Gran Teatro la Fenice to celebrate the Gran Ballo della Cavalchina. This party for the riders (i cavalieri) was the most lavish, unusual, exclusive and international of balls, with the most beautiful masks, the most luxurious feasts, the best orchestras and the most impressive shows. In the same way, following this great tradition, the Gran Teatro La Fenice will once again be transformed for one night into a grand and elegant ballroom. Attired in masks and evening dress of the period, you will be able to enjoy a captivating and varied programme of entertainments, savour an exquisite dinner, attend the Cavalchina prize-giving ceremony and dance into the early hours, celebrating one of the world’s oldest carnivals. This spectacular show promises to be the most magical of soirees. An event which must be experienced to be believed.